If you are a complete beginner to motor boating and intend to crew or skipper a motor cruiser of more than 7 metres, then you should begin with a Helmsman Course. If you already have boating experience and have either an RYA Powerboat 2 qualification or an RYA Day Skipper (sail) qualification, then you can probably by-pass the Helmsman course and go directly for the Day Skipper (Motor) course (theory and practical). 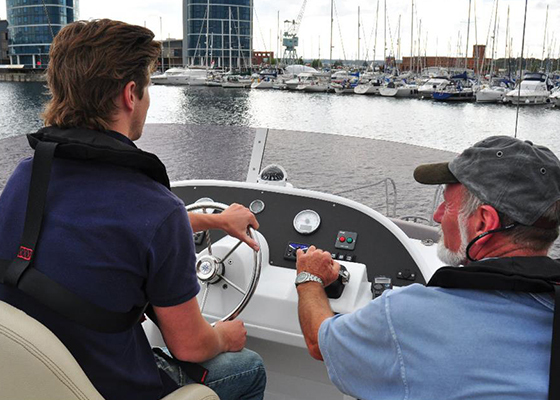 If you have no RYA qualifications but you have good experience of driving RIBs or sailing yachts with auxiliary engines you may also be able to go straight for the Day Skipper (Motor) course. Call us or email for further advice. The Day Skipper (Motor Cruising) course teaches you how to skipper a motor cruiser and its crew in familiar waters by daylight. It will give you sufficient knowledge and basic skill to be able to operate a boat safely on inshore passages in moderate conditions. For most people this is sufficient training for their purpose and its enough to obtain an International Certificate of Competence. Before you undertake the Day Skipper practical course you should have completed most or all of a Day Skipper Theory course. The theory course is common to both power and sail and it provides the essential foundation in safety, tidal navigation, pilotage, weather, rules of the road and passage planning. If you already have this knowledge from experience at sea then you could go directly to the practical course. But without such knowledge you would not get full value from the practical course and you might not reach a sufficient standard to gain a certificate at the end. Combined Helmsman and Day Skipper Course. If you are a complete beginner but want to reach Day Skipper standard, then you can combine the Helmsman and Day Skipper practical courses into one ‘Combined’ course of 5 days duration. This may be a more economical option. In this case you should complete most or all of the Day Skipper Theory course beforehand. 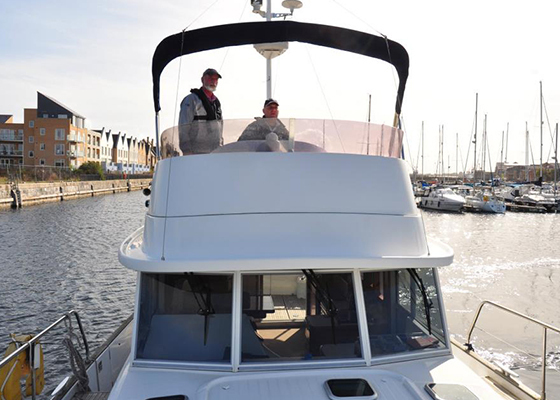 If you have built up some experience on motor cruising boats, including some skippering experience, and want to extend your skills and learn how to undertake safe coastal and offshore passages by day or night, then you should consider taking the RYA Coastal Skipper (Motor) course. In judging whether you have sufficient experience for this course you can count time spent as skipper on sailing vessels with auxiliary engines. (Note that such experience on sailing craft does not count towards experience requirements for the Yachtmaster (Coastal) Certificates of Competence which are separately defined). 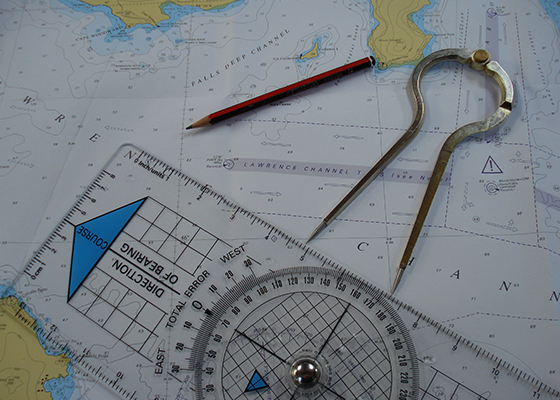 In any case, you should first complete the Coastal Skipper and Yachtmaster Theory course. 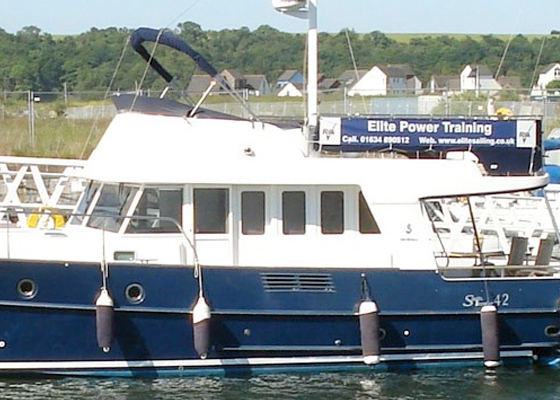 The Coastal Skipper practical is the most advanced formal practical course. If you complete it successfully you will receive a course completion certificate. As with the Day Skipper course completion certificate, it is sufficient evidence for issue of an ICC. It is also generally accepted by charter companies as evidence of a higher level of competence as a skipper. However, it is a different thing from a Certificate of Competence which requires prescribed experience in terms of miles and days at sea and independent examination. Certificates Required to Work as a Commercial Skipper. In the UK, you can work commercially on motor vessels subject the MCA codes of practice for small vessels if you have a valid commercial endorsement on your skipper certificate. The commercial endorsement is issued by the RYA. As well as your skipper certificate you will require a satisfactory medical examination (ML5 or ENG 1) a Sea Survival course certificate and a valid First Aid at sea and VHF certificate. Day Skipper Course Completion Certificate. You will require Day Skipper Theory and Practical course certificates and at least 12 months relevant experience in the area concerned. The endorsement is then valid for commercial use up to 20 miles from a nominated departure point in favourable weather and daylight only. Coastal Skipper Course Completion Certificate. Conditions as for Day Skipper. Yachtmaster (Coastal) Certificate of Competence. Valid up to 20 miles from a safe haven. Yachtmaster (Offshore) Certificate of Competence. Valid up to 150 miles from a safe haven. Yachtmaster (Ocean) Certificate of Competence. Unrestricted.